The sailing adventures of Captain Kirk & Heidi, Tosh and Tikka Hackler . . . Shake, Rattle, and Roll: The Capitán Turns 70! Hurricanes, Coral Reefs, and Climate Change, Oh My! PEACE, LOVE and Geckos to ALL! Back in the USA y Bienvenidos a México! Between a trip to the states for Heidi's dad's 88th birthday (where we had to wear WAY too many clothes!) and running into yet another engine glitch... Life is great! 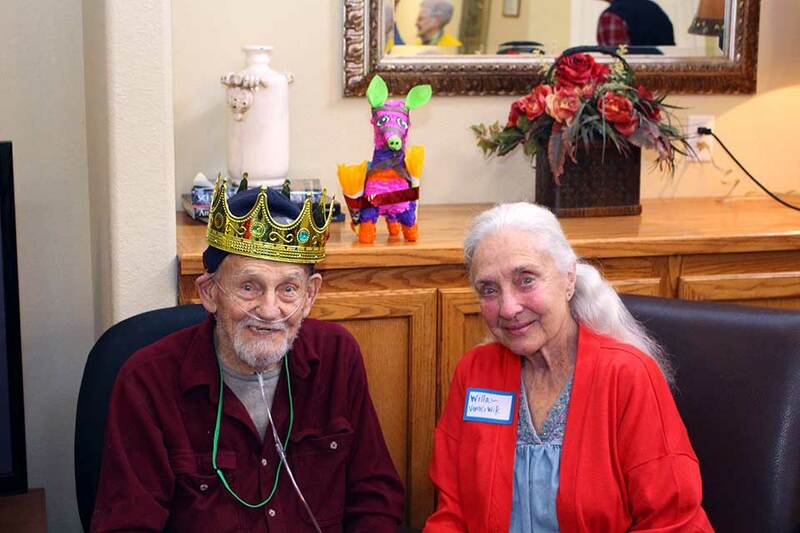 The 88th Birthday King Verne and his wife Willa. If we have to be stuck in paradise awaiting another engine part, at least we have visits from friends and family, and plenty of fun things to do! 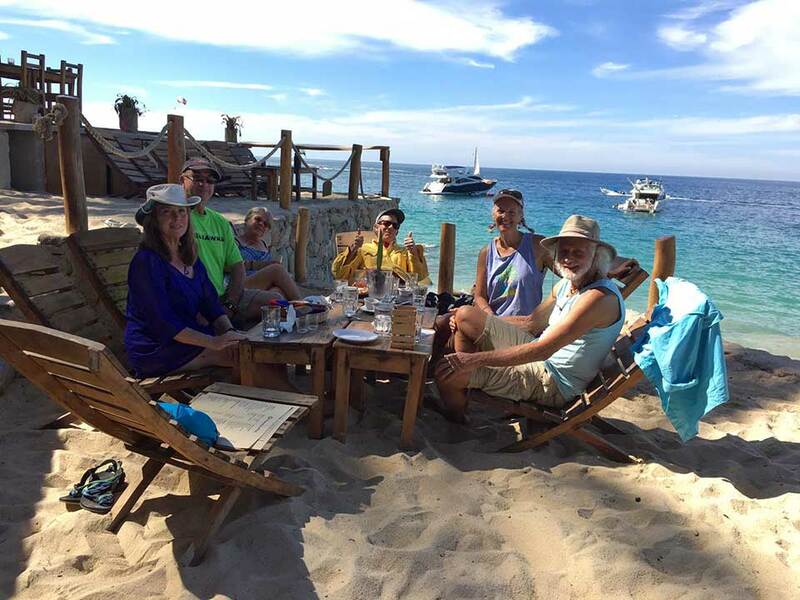 We had a fantastic time in February when two sets of friends visited us and we got to share whale watching in Banderas Bay with Laura & Will and Lal & Eric. Laura & Will also brought us some boat parts, and a few other items from the states that we can't find in Mexico. This week we have Heidi's brother Arne, sis-in-law Teresa, and our niece Annika, plus several of Anni's friends coming to hang out in Puerto Vallarta for spring break. Life is great! Clockwise from left: Lal, Heidi, Judy, and Laura whale watching on a Juan Bravo Panga tour. A lunch stop at Maraika Beach Club is always a delicious treat, and this time was no exception! Eulalie (Lal), Eric, Judy, Will, Heidi, and Kirk. As you may recall, we had our engine water pump rebuilt here in Mexico last spring. Sadly the the rebuild was faulty... so BIG thanks Arne & Teresa for bringing us a brand new water pump this week! This is no small feat, as our 20 year old Perkins engine is no longer manufactured and spare parts are becoming harder to find. Luckily Kirk has a good stable of Perkins part dealers around the US, and when we need something he is usually able to find a part, but they are becoming fewer and further between, several times we've bought the last one available! With any luck at all, our trusty engine "Michael P" will be up and running, with leak-free oil and water pumps again by next week! Life is great! Our most exciting news of late, is that Tosh is a medical miracle! He's recovering nicely from his nasal tumor, thanks to Homeopathic remedies from Australia! We have been extremely happy with the results from Holistic Animal Remedies, (another BIG THANKS to friends Wai-Lin & Terry for turning us on to them!) In fact, Tosh's vet here in Vallarta is blown away. 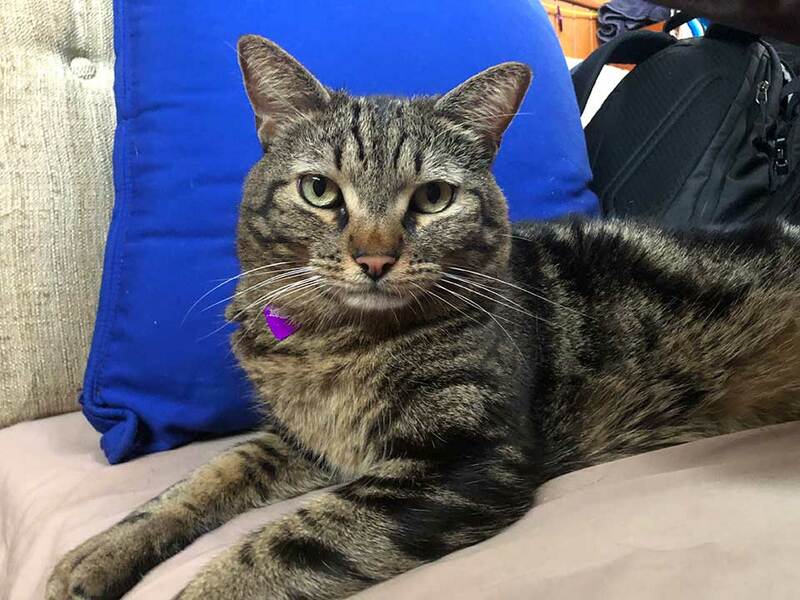 He actually asked us for the information on what remedies we've been treating Tosh with, because he's never seen an animal recover from a nasal tumor like this. 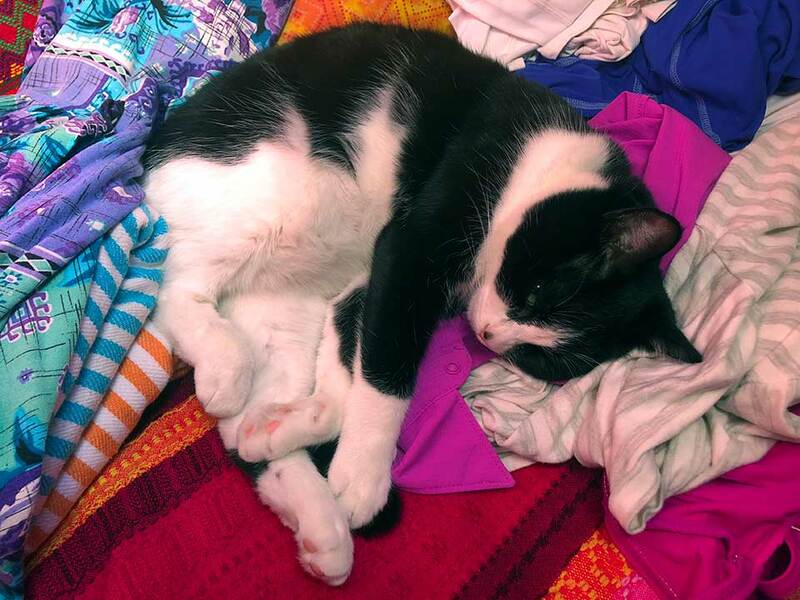 We've opted not to do another invasive biopsy procedure to confirm it's really all gone... but we are over the moon with Tosh's revived personality, increased energy levels, easier time eating, gaining weight again, and even the shape of his face is going back to normal. Kirk is excited to have his journeyman mechanic back helping him again! Tikka is also very excited that Tosh is back to chasing her around and pouncing on her while she's sleeping (NOT! ), as siblings will do... We can hear her say "He's touching me!" Life is great! Since we are currently short on time to write and long on photos this post is primarily a photo blog. A photo is worth 1000 words anyway, so sit back, relax, and enjoy! Be sure to check out our photo gallery for more photos of friends, family, and adventures around Banderas Bay! 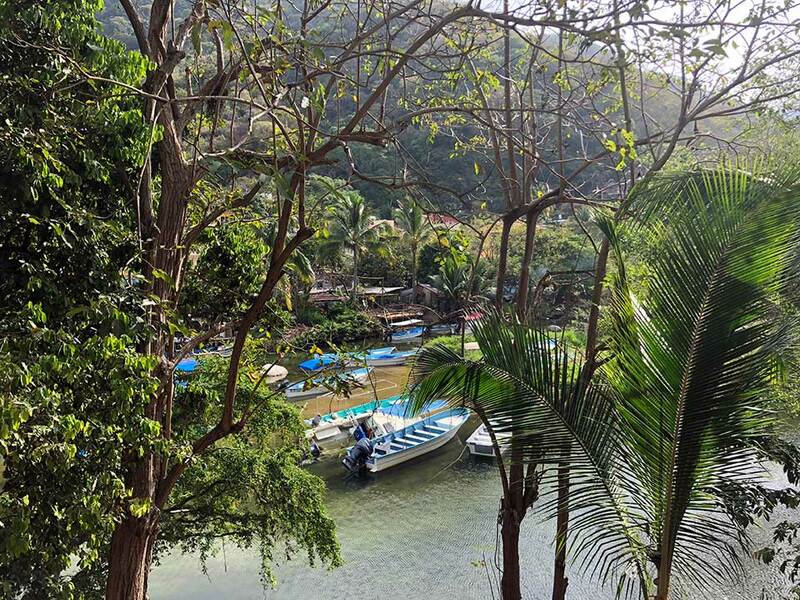 Another local attraction we love to share with visitors is the hike from Boca de Tomatlan to Las Animas. This 3-mile section of trail (one-way) winds up through lush jungle and open forest with ocean views, past waterfalls, and back down along the beach. 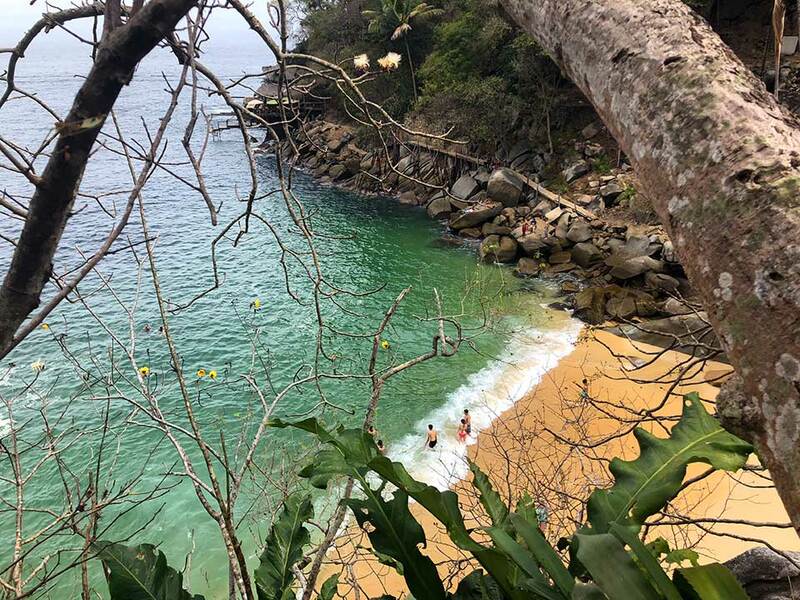 Those who are more intrepid can continue another 1.5 miles to Quimixto, or 7-miles all the way to Yelapa. Water Taxis are available for the return for those who don't want to hike back. We recently hiked this trail with friends and fellow cruisers, Judy & Paul from s/v Grace, and Christina & Alex from s/v Blue Wind. 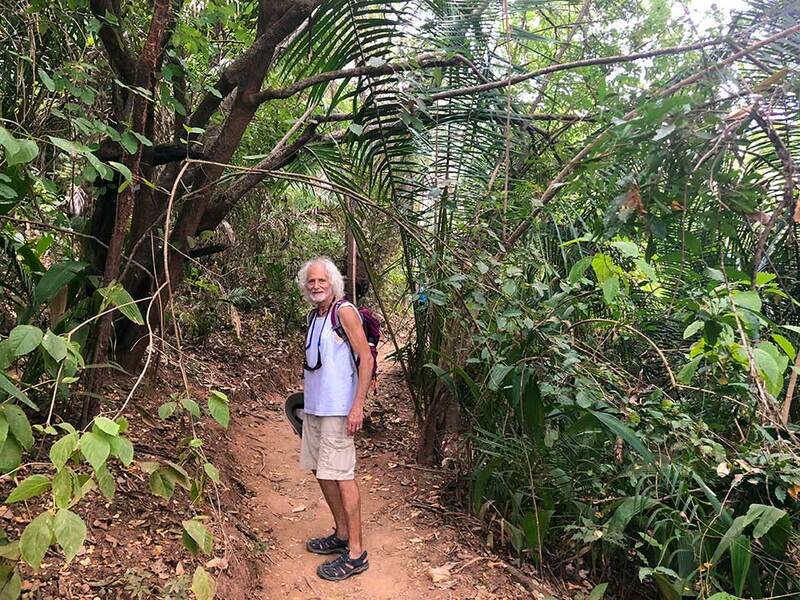 The trail is well maintained and well traveled through the jungle which would otherwise quickly take back the trail... Remember, just because you didn't see the Jaguar, doesn't mean he didn't see you! The trail crosses playa Colomitas and winds up the hill giving an exquisite view back down onto Colomitas beach and the boardwalk trail along the shore we'd just walked on. 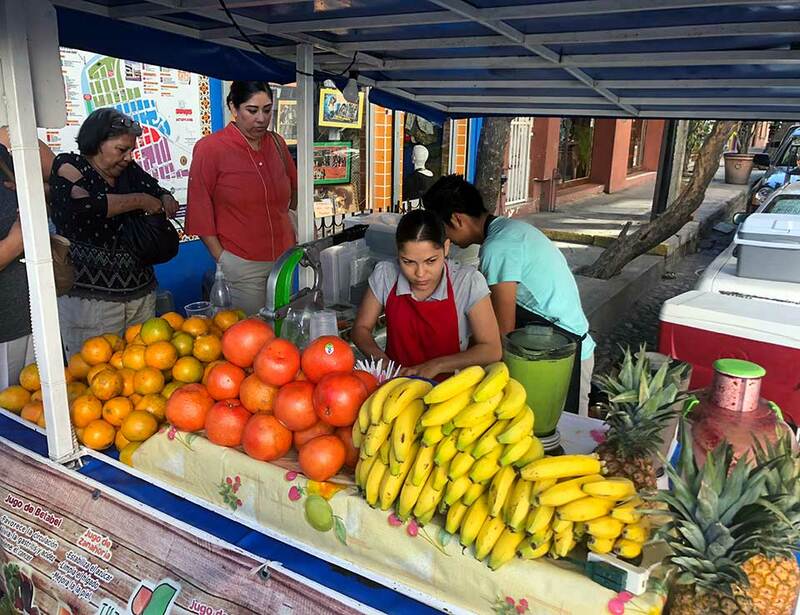 If you're thirsty at the end of your hike, fresh Cocos await! They'll machete off the top for you to drink the coconut water out of. 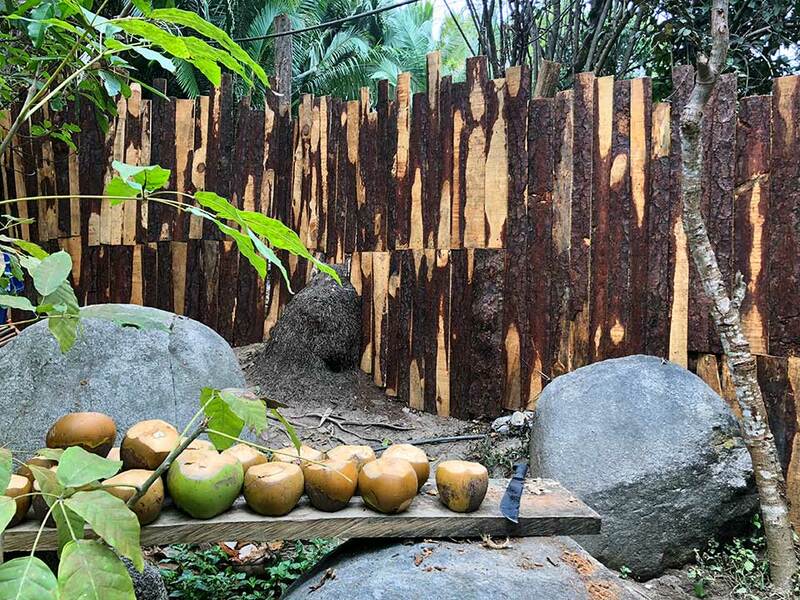 Then when you're done drinking, they'll machete it in half and scoop out the coconut meat for a yummy snack! 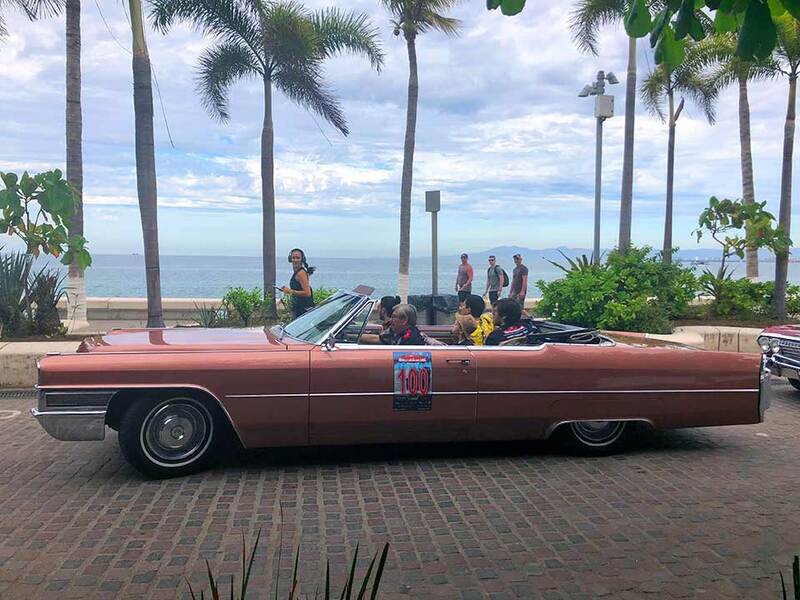 What could be better than an old car show complete with Pink Cadillac and palm trees? Stay tuned for our next blog post to find out! PS. 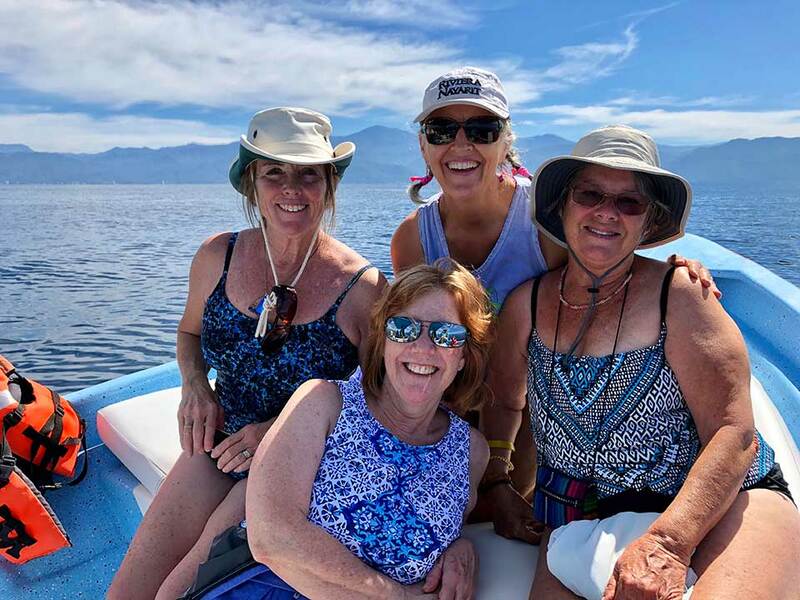 Check out our photo gallery for more photos of friends, family, and adventures around Banderas Bay! Captain Kirk grew up sailing on Lake Washington and has been boating his whole life. He has been racing sailboats for about 40 years, including two Vic-Maui races (from Victoria, BC to Maui, Hawaii), one in 1990, and the other on Due West in 1996. [...]Kirk has also crewed on numerous deliveries on the west coast of the US from Alaska to Mexico, and Florida, and the Caribbean. He is a USCG licensed Captain. First-mate and "Navi-GIRL" Heidi has been sailing for 25+ years. She had the good fortune to be exposed to sailing as a kid on the Chesapeake and in the Caribbean, though she didn't really "learn" to sail until college. She also raced Vic-Maui on Due West in 1996, including organizing and provisioning for 8 crew for 25 days (even though we finished the race in 17 days.) She has crewed on several deliveries from Seattle to California. Heidi is also a certified Holistic Health Coach who blogs about holistic health and nutrition at Happy Well Lifestyle, and reps an amazing line of toxin-free, cruelty-free, fair-trade, sustainable, organic Health & Beauty products out of the UK, Neil's Yard Remedies Organic. Heidi & Kirk met racing on an old 44' IOR boat, and have spent the past 25+ years racing and cruising around the Pacific Northwest and California. We have also chartered many times in the Caribbean, in both the Grenadines and in the British Virgin Islands. We are THRILLED to finally have kitten-energy back aboard Due West again! Our new crew-mates, Tosh (Bengal Tabby) and Tikka (Tuxedo) are a bundle of energy and JOY, and are getting their sea legs. Cruisers", and our cruising friends call us "The Racers." We consider ourselves to be "Performance Cruisers," and are looking forward to finding racing opportunities in other countries as we cruise the world. We are particularly looking forward to racing in Antigua Race Week once we get over to the Caribbean side of the world.